For well over a century, stars and supporting players on baseball diamonds have become stars and supporting players in the movies, on Broadway, in vaudeville and, eventually, on television and in concert halls. After all, ballplayers are celebrities. Whether on the field or the stage, they are in the business of entertaining the masses. Not surprisingly, many showbiz luminaries have become baseball enthusiasts. They have invested their time, money, and expertise to be part of the baseball world as team owners and fans. 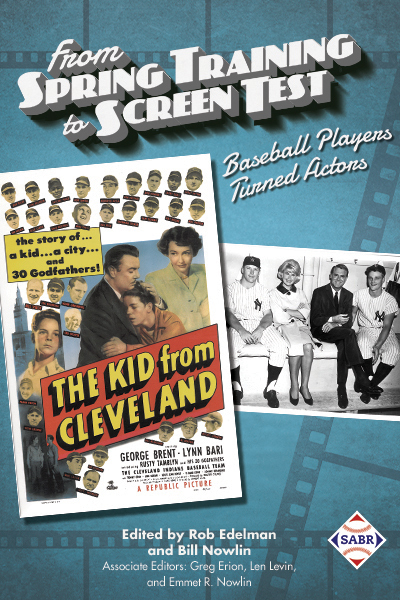 From Spring Training to Screen Test: Baseball Players Turned Actors includes essays by 43 SABR members that connect baseball and show biz. Not every ballplayer who ever made an appearance on screen or stage is included; to do so would result in a mini-encyclopedia. The purpose here is to offer a representative selection of those who crossed the lines between professional sports and popular entertainment. Included are biographies of selected individuals from the famous (Gene Autry, Joe DiMaggio, Jim Thorpe, Bernie Williams...) to the forgotten (Al Gettel, Lou Stringer, Wally Hebert, Wally Hood...) There are other select topics, from baseball on television shows and in Coca-Cola commercials to Jim Bouton’s casting as “Jim Barton” in his Ball Four TV series and Don Drysdale playing “Don Drysdale” on The Donna Reed Show, Leave It To Beaver, and The Brady Bunch. Those who will relish the privileged peeks at the off-the-field life and times of Mike Donlin and Edward G. Robinson playing Hans Lobert on the big screen in Big Leaguer will surely savor From Spring Training to Screen Test: Baseball Players Turned Actors. Contributors include: Audrey Levi Apfel, Eric Aron, Lawrence Baldassaro, Russell A. Bergtold, Jay Berman, Michael Betzold, Charlie Bevis, Ron Briley, Bruce Bumbalough, Frederick C. "Rick" Bush, Alan Cohen, Warren Corbett, Rory Costello, Rob Edelman, Greg Erion, Eddie Frierson, John Gabcik, Eric Hanauer, Bill Hickman, Paul Hofmann, Jay Hurd, Don Jensen, Maxwell Kates, Seamus Kearney, Adam Klinker, Ted Leavengood, Bob LeMoine, Len Levin, Bill Nowlin, Emmet Nowlin, Dan O'Brien, Will Osgood, Mark V. Perkins, Richard J. Puerzer, Gary A. Sarnoff, Mark Souder, Jon Springer, Andy Strasberg, Clayton Trutor, Joseph Wancho, Phil Williams, Gregory H. Wolf, and Allan Wood. E-book: Click here to download the e-book version of From Spring Training to Screen Test for FREE from the SABR Store. Available in PDF, Kindle/MOBI and EPUB formats. E-book: Click here to purchase the e-book version of From Spring Training to Screen Test for $9.99 from the SABR Store. Available in PDF, Kindle/MOBI and EPUB formats. This page was last updated February 27, 2018 at 10:13 am MST.